For those seeking solitude and recreation in a scenic natural setting, Goodan Ranch and Sycamore Canyon Open Space Preserves have much to offer. Visitors can hike along miles of trails, where they will enjoy grand vistas, abundant wildlife, and interesting reminders of the long and varied history of man’s use of the area. Sycamore Canyon consists of 1700 acres of coastal sage scrub and chaparral-covered hills nestled between the cities of Poway and Santee. Bordering on the west side and stretching through the valley floor is the 325-acre Goodan Ranch, a mix of diverse habitats including grassland, riparian, coastal sage, oak woodland, and mixed chaparral. Goodan Ranch is rich in early American history. 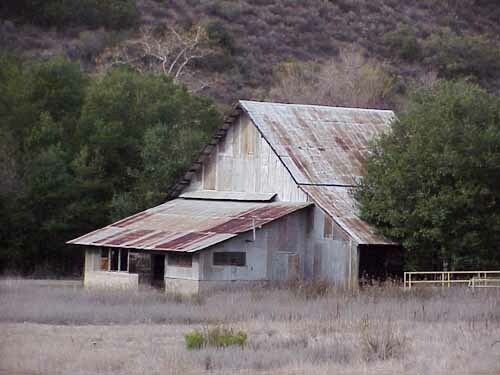 Present day structures at the preserve date back to the 1930s, when it was a working ranch. Today, Goodan Ranch is jointly managed by the cities of Poway and Santee, the California Department of Fish and Game, and the County of San Diego Department of Parks and Recreation. Goodan Ranch and Sycamore Canyon are enjoyable for their peaceful solitude, recreation opportunities, and beauty. You’ll find a multitude of different plant and animal habitats, including coastal sage scrub, southern mixed chaparral, oak woodlands, riparian, and native grasslands. Common plants include California sagebrush, buckwheat, chamise, lilac, manzanita, lemonadeberry, coast live oak, sycamores, arroyo willow, and various native grasses. Mule deer, coyote, bobcat, rattlesnakes, and birds such as California gnatcatchers, Hutton’s vireos, and scrub jays are among some of the wildlife you may discover. The photo above was taken before the 2003 fire. I received the following letter from Garner. I regret to request that you remove me from the Board of the Friends of Goodan Ranch. I am focusing my attention more on my family life and am cutting back on meetings and boards. I am still interested in Goodan Ranch/Sycamore Canyon and will try to make the JPA meetings. I still find it very frustrating that I can no longer legally get from Santee to Goodan Ranch. Thank you for all you do and my best wishes for all of you in the future. In Attendance: Carol, Phoenix, De Anne, Ann, Terry. A quorum was present. -Poway Historical Society 50th anniversary Sept 13 Historic Tour; Sept 14 Rummage sale & speakers. -Gardner Grady resigned as VP 6/9, Ann agreed to take VP position. Thanks Ann. -How to recruit new members? Did you see 92064magazine.com Aug/Sept issue? Poway Historical Society is featured. Join them as they celebrate 50 years on Sept 14th,. A huge rummage sale will be on the south side of the building housing the museum and the Hamburger Factory from 9 – 1. Speakers at 11 include Vince Rossi, San Diego Story Seeker. Santee Historical Society is having a “Barn-B-Q” on Sat Sept 20th. New members joining that day get lunch at member price of $2.50. Guests pay $5.00. The Barn is on Magnolia Ave., Santee. Blue Sky Ecological Reserve has an afternoon of natured-themed activities beginning at 1pm on Sat. Oct. 11th to celebrate their 25thAnniversary. Exerpts from the “Chararralian”, Rick Halsey’s latest letter, follow; see his web page for wonderful photos. A severely burned forest is not a “destroyed” forest, but rather a habitat restored. That is not something you are likely to hear during or after the next large forest fire in the Sierra Nevada. It certainly wasn’t during the 2013 Rim Fire in Yosemite and theStanislaus National Forest. It should have been, however, because the science is clear – severely burned forests provide some of rarest and most biodiverse habitats on earth. Severely burned forests should be left alone, protected, and allowed to thrive without our meddling. This is why we are fighting to stop “salvage” logging and “reforestation” plans in the forest burned by the Rim Fire. The Forest Service will make a decision about what they will to do in a few weeks. Stay tuned. – Lydersen, J.M., M.P. North, B.M. Collins. 2014. Severity of an uncharacteristically large wildfire, the Rim Fire, in forests with relatively restored frequent fire regimes. Forest Ecology and Management 328: 326-334. Have you found an injured or orphaned bird or mammal in San Diego County? Over ten miles of trails and service roads open to hiking, mountain biking and equestrian use. Preserve visitors are welcome to visit our visitor center. Live animals and exhibits on Goodan History, Cedar Fire, Kumeyaay and the MSCP are on display. Events, hikes and programs start at various Preserve locations. Some require a one mile walk from Goodan Ranch staging to the Visitor Center. ALLOW ½ HOUR TO PARK AND WALK TO THE VISITOR’S CENTER. Please check descriptions closely. No vehicular traffic is permitted in the Preserve. Transportation for those with disabilities can be arranged, by calling the ranger at (858)513-4737. Goodan staging area accessed from Poway Rd. east on Garden Rd, then south on Sycamore Canyon Rd. Sycamore Canyon Rd. ends at parking lot. Highway 67 staging area accessed through SOUTHBOUND Highway 67 only, half a mile south of Scripps Poway Parkway. All events are free. For information or to make event reservations call (858)513-4737 or email Justin.Gibbons@sdcounty.ca.gov. During rainy weather and post rainy weather the Parks Preserves are closed for safety and damage control due to muddy, wet trails and roads. Please check the Parks website or call the ranger’s office at 858-513-4737 for Preserve status. All Memberships are from 1 January of each year. There have been two small fires in Sycamore Canyon already this year. (One to the south on 17 May and one to the east on 24 May. Due to fires in other parts of the county, the JPA meeting was cancelled. Please pray for fire fighters and rangers as they protect our homes and Open spaces. Our web master, Chris Yandall died. He was so young. In Attendance: Carol Crafts, Nancy Ujazkowski, Karen Larsen Gordon, Terry Callan, DeAnne Erickson, and Phoenix Von Hendy. A quorum was present. Meeting was called to order at 6:45p.m. A motion was made and passed to accept the minutes. Treasurer’s Report: Income for 2014 is $320 for family memberships. Expenses for the year are $505.91. Total $13, 658 savings, $504 in checking in assets. The County Parks Society submitted an incorrect statement, although a $500 donation was made for the movie program. Correct documentation is pending. Tracking Report: Winter survey had significant deer sign and more wood rat nests. “The working group met recently to walk the Foster Truck Trail. Permission from CAFW was needed to get onto their land (where a large part of the trail lives) and they stipulated that only full time employees of agencies were allowed on the hike (in other words, I was banned). I’m not sure of the viability of this route for the CTC because of CAFW ownership and also because at some point the future elevation of San Vicente Reservoir will be above the road’s current location. A southern option for the CTC may be needed. An estimate of cost is still pending from staff regarding bird supplies/fencing/food.
? Movie Date & Time Unknown for “Movie In the Park”, Ranger Justin will notify Wednesday. CINCH Brochure: Is still in publication. DeAnne purchased two rakes to accompany the shovel used for horse manure. She will receive a reimbursement from Friends. Phoenix inquired about the installation of the motion sensor cameras. Nancy will research the Poway Days Parade in order for Friends to participate. Sustainable Scripps Ranch Fair: May 18th from 11am to 5pm. Friends have registered for a table in collaboration with the San Diego Tracking Team. Phoenixand Carol will set up and Karen will also volunteer. Chris Yandall, the Friends’ web master, passed away recently. His daughter has contacted us regarding providing the passwords and access information regarding our website. Phoenix will follow up and assume the responsibility of posting current minutes, and maintenance is to be determined. Chris owned the company that hosts the web site based on Word Press. The domain name is registered until December 12, 2014. A motion was made and passed to find a way to honor him with a donation towards skateboarding in Poway or an organization close to his heart. The next JPA meeting will be held May 14th at 1:00p.m. at Goodan Ranch. Teri and Karen will attend. Summer Movies In the Park: Justin booked August 30th to show the movie “Frozen” at Goodan Ranch. Andy Keane sent to Carol the EIR for Sycamore West open to public comment. Teri will take the document for review. Of primary concern is off-trail use by equestrians and mountain bike riders. Carol presented copies of news articles that chronicle the formation of Goodan Ranch. Poway Historical Society was purging files, so she will add them to the organization’s notebooks. Mary Shepardson will be asked by Carol to join Friends due to her extensive involvement in Poway Trails. Meeting was adjourned at 7:45pm. Next meeting: August 4, 7:00pm at Coco’s Poway. In an earlier post I mentioned the community of Stowe, which was located in the Beeler and Sycamore Canyon areas of what is today southeastern Poway. It was a small farming community with a one-room school and one post office and, for a time, a literary society. The Stowe Literary Society may have had a short life which came as Stowe itself was disappearing. The post office closed in 1905, the school in 1906, and references to the town in San Diego newspapers end after 1911. But for at least a year during 1904 the people of Stowe met regularly for cultural education as well as a good time. Each meeting included discussion of the works of a well-known author–Dickens at one meeting, Washington Irving at another. Then members would get a chance to read or recite their own work. The evening would end with a “basket social” (auctioning off baskets of homemade goodies), or a formal home-cooked supper, or a dance. The member recitations might include work by local school students. The meeting held on February 27, 1904, declared a “leap year social,” included the reading by school teacher Margaret Woods of “seven original stories written by her pupils,” with the audience then selecting the winner, according to the Union. The local teachers and their students of all ages, as well as many of the town’s adults appear to have been regular participants. Andy Kirkham, who was then 20, served as the society president for a time. Each meeting also included a reading from the Stowe Journal, which sounds like it may have been a sort of literary community newsletter. There were also, of course, spelling bees. Again we can thank Andy Kirkham for the details. Sources for this post included historic San Diego newspapers and the archives of the Poway Historical and Memorial Society. Carol’s comment: Uncle Tom’s Cabin was published in 1852. Did this group of homesteaders name their area Stowe in honor of the author, Harriett Beacher Stowe? This is not a major hiking trail, but significant in that it extends the Mission Valley walking paths west under 163.